This hand lotion is perfect for multiple applications during the day. It's not greasy or too heavy on my hands. It's really easy to use, and it spreads and absorbs into the skin very well. This stuff is worth buying, in my opinion. Not sticky or greasy, smells good, great for multiple applications. Smell doesn't last very long. 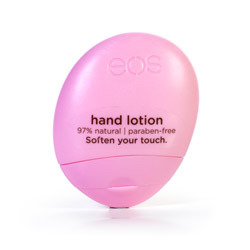 EOS Hand Lotion is the perfect hand lotion for your purse. It's palm sized and you never have to worry about leakage. Personally, I think it has a cute shape with a pretty soft pink color. This hand lotion by EOS is 97% natural and also free of any parabens. Great, isn't it? I received the Berry Blossom hand lotion. This contains 1.5 fl oz of lotion. The texture is just like any other hand or body lotion. It has a milky white color, and one thing that I love the most about this lotion is that it's not greasy, not too heavy, and it doesn't feel sticky after using it. I usually don't even wear hand lotion because it makes my hands feel sticky afterwards. You won't experience stickiness with this hand lotion! Another great thing about this EOS hand lotion is that it does a really good job at keeping my hands very soft throughout the entire day. I love that. It may not be as hydrating as some would like, but I actually prefer applying the heavier and hydrating lotions at night time, before I go to bed. I also love the smell of this lotion! It doesn't last very long, but it smells delicious. The smell is like a strawberry candy, so you have to enjoy sweet and fruity smells to wear this stuff on your hands every day. If you don't like sweet and fruity smells, then go for the unscented version, because this stuff is great! I'm pretty sure you will love it as much as I do! Water (eau), Glycine Soja (Soybean) Oil, Cocoglycerides, Glyceryl Sterate, Dimethicone, Glycerin, Cetearyl Alcohol, Sodium Stearoyl Lactylate, Helianthus Annuus (Sunflower) Seed Oil, Aloe Barbadensis Leaf Juice, Avena Sativa (Oat) Meal Extract, Tetrahexyldecyl Ascorbate, Tocopheryl Acetate, Retinyl Palmitate, Fragrance (Parfum), Carbomer, Methylchloroisothiazolinone, Methylisothiazolinone, Dmdm Hydantoin, Sodium Hydroxide, Tetrasodium Edta, bht.